Published: Nov. 25, 2018 at 02:32 p.m.
Buffalo Bills linebacker Matt Milano intercepts Jacksonville Jaguars quarterback Blake Bortles' tipped pass. Published: Oct. 14, 2018 at 03:16 p.m.
Buffalo Bills defensive end Jerry Hughes forces fumble on Watson, rookie defensive tackle Harrison Phillips recovers the ball. Published: Sept. 23, 2018 at 01:36 p.m.
Buffalo Bills defensive end chases down QB Kirk Cousins for a big strip-sack and is recovered by linebacker Matt Milano. 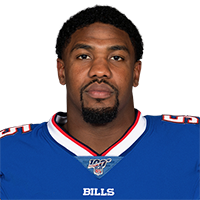 Published: Nov. 8, 2015 at 03:14 p.m.
Bills Jerry Hughes forces and then recovers fumble.